As cute as cats may be, they can become a real hassle when they scratch up your furniture! That is just one of the reasons why it is essential to buy a good scratching post for cats. Scratching posts will satisfy your cat’s need to scratch and claw. Let us help you figure out why it is so important and what you should look for in a scratching post when buying. Finally, we will give you our advice on some of the best scratching posts for cats available on the market! If you don’t have time to read the entire article, here is a quick overview of our favorites. Full reviews are available if you scroll down. Why Does Your Cat Need a Cat Scratching Post? Cat’s have an innate need to scratch and claw. Your cat must have somewhere they can satisfy their desire to scratch and shed their nail sheaths. Providing a scratching post will prevent your cat from tearing up your furniture, drapery, and carpeting. Why is having a cat scratching post essential? This is a well know reason. By scratching, your cat removes old nail sheaths and enables newer and sharper claws to come out. Cat’s use their scratching post for stretching and exercise, it helps them tone their muscles and stimulate their brains. That is also why choosing the right scratching post is vital to your cat’s health and well-being! We would say a scratching post is most vital for enabling your cat to “mark his/her territory.” It is so important to keep in mind your cat needs their own place, to show off to guests whose territory there are trekking on. Placement of the post is also important to keep in mind. 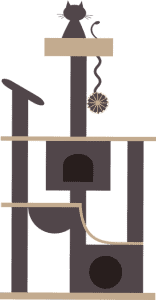 Putting the post in a prominent location (even right next to other tempting scratching places, i.e. the couch, etc.) would make your cat choose to scratch the post, rather than that precious armchair. You know it already, but a cat is a very active animal. Cats can get bored easily. A scratching post for cats is a way to release their energy and prevent boredom. Yes, cats are a little bit like us (or is it the opposite?). Scratching is different for them if they do it while they are alone or in the presence of other cats or humans. It’s a way to show the intruder whose territory they are in. How to Find the Best Cat Scratching Post for Cats? There are a few criteria you need to look for when buying scratching posts for cats. Don’t worry, it’s easy. First, consider the type of material you want. Second, consider the size and stability of each scratching post to see if it’s a right fit for your feline. A fibrous and durable sisal material is ideal for conditioning nails; keeping them healthy and maintained. We personally like sisal material because though it is pricier, it will last for years before needing to be replaced. The sisal accomplishes the same purpose as tree bark outside, thus offering cats a natural sense of scratching and clawing. As your cat scratches the post, the sisal catches the front claws so when your cat pulls downwards, it releases the sheath to expose the new claw underneath. Sisal is also the most popular choice among cat parents, and also among cats! Both enjoy the stability and durability that sisal offers, as Paul, Yoda and I have come to learn, too! 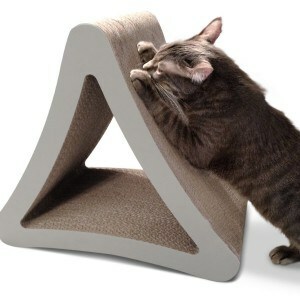 Manufacturers more and more are releasing designer scratching posts that integrate better into your home. The material used is reinforced cardboard. 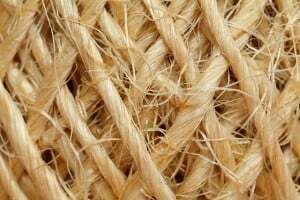 It’s almost as durable as sisal material and lasts much longer than you can think, but it’s not the same as sisal. 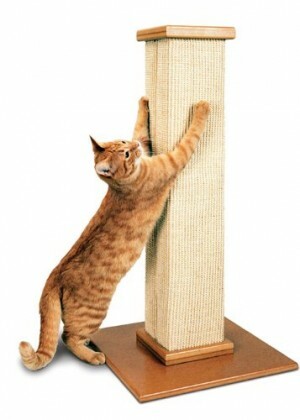 The scratching post for your cat should be tall enough so your cat can fully stretch on it! As you read before, it’s essential for your cat to have a right-sized scratching post! That being said, stability is a key factor as well. Your cat can be very active and playful when scratching and you don’t want this scratching post to fall over and injure your cat or break something. When you are about to choose a scratching post you have two solutions. Long-lasting scratching posts or more temporary ones (see cheap scratching post). Whatever your choice may be, we guide you to find the best out of its category! When we first got Yoda, we started with one of the cheap ones but quickly upgraded to something sturdier and it was worth it! If you don’t want to renew your scratching post every now and then, this is the solution you have been looking for. Let’s put it simply, it is the best quality we found in a scratching post. The higher quality of materials (fibrous woven sisal fiber) makes it so strong that your cat will be able to use it for years. Check out reviews on Chewy and see for yourself. Some customers have been using it for more than 5 years and if you know how much cats love to scratch, then you know it’s a long time. Because it’s higher than usual posts (32 inches), your cat will also get a full stretch when he scratches on it. It’s good for his health! No worries about it tipping over (well if your cat is a hulk it can still happen but the base is wide enough to prevent it from falling). 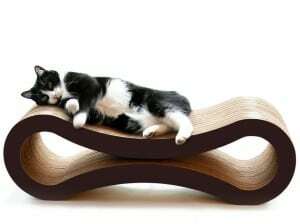 It’s a simple design but it’s an extremely efficient and long-lasting scratching post! We recommend! Tip: If your cat is not interested at first, place his favorite toy on it or some catnip. Does your cat tend to always scratch the prettiest things in the house? You may have a great solution with this cat scratching post! It almost looks like a designer object that gives a cool touch to the room you place it in. It is pretty big as you can see in the picture, so it’s perfect if you have a big cat or several cats! They can lay on it, they can play around it, and it has two sections for the cats to run through which makes it even more enjoyable for them. We believe it can last up to 4 times longer than regular scratchers, so it’s definitely worth the investment. Why we like it: Contemporary design, interactive, strong and durable, reusable, environment-friendly. 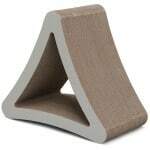 Frisco is a Chewy-exclusive brand of pet products, so you won’t find this cat scratching post anywhere else. It is designed to withstand cat scratching of all ages, from kittens to large cats. 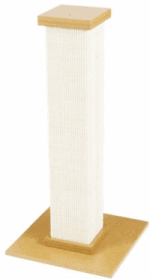 The scratching post is wrapped in sisal with a double-layer, plush-covered baseboard for extra stability and comfort! Adventurous kitties can jump on top to perch themselves high above the ground on this cat scratching post! It’s the 3rd tallest post out of our recommendations, enough space to provide your cat with a full-body stretch. 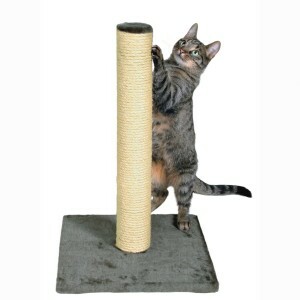 The Frisco scratching post is simple and available at an affordable price. Why we like it: Affordable and sturdy, great for all ages. Tip: The top layer is plush, but you could nail in a ball on a string to the top if you wish to add a DIY toy to this cat scratcher. If you have a particularly large cat or a multi-cat household, the MidWest Forte 41-in Cat Scratching Post is a good choice. It is the highest of all the cat posts, at over 3 ft tall. There is hefty sisal wrapped around the post with a double base layer to provide sturdy support. Like the Frisco cat post, this one features plush faux fur to be soft on your cat’s paws. It also comes packaged with tools for easy assembly. It’s more expensive than its competitors, for practically the same features except for the extra height. 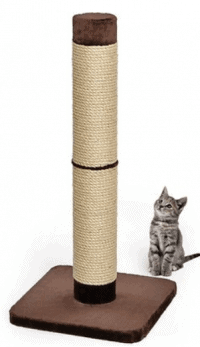 Bottom line: If you need lots of height, this is the cat scratching post to buy. Why we like it: Provides a few extra inches for those extra long kitties and serious body-stretchers. Tip: Easily clean scratching posts (with faux fur) with a wet wipe or vacuum to remove excessive pet hair and dirt. If you are looking for an inexpensive but efficient cat scratching post for your cat, this is what you should choose.It is not of highest-quality, but it does the job! Among the crazy number of scratching posts like this, we selected the one from Trixie Pet Products for its simple design (plus, we like gray). The extra plush added to cover the bottom and the top makes it easier to integrate into your interior (if you like that). The base is wide enough to give the ensemble a perfect stability. It’s important as your cat can push it hard sometimes and you don’t want it to tip over. Why we like it: Very affordable, simple, great for kittens to medium-sized cats. Same brand as the Pet Fusion lounger, but a different style and design. 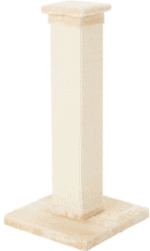 It keeps its classy style and durability while providing a unique twist on the classic cat scratching post. It’s definitely a fun piece of furniture for your cat to scratch on the sides, stand on top, or run through it! 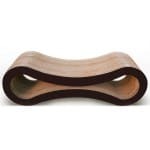 It is made of the same recycled ultra-dense cardboard material than its big brother (the ultimate cat scratcher lounge) so it is very durable and eco-friendly. Let’s not forget to mention that you have 3 sides, so you can turn it around as soon as one side is used, making it last longer than other cheap scratching posts! If you think that the usual sisal rope scratching posts look tacky, well this is a scratcher to consider! Why we like it: Unique design, interactive, strong and durable, environment-friendly. Tip: We recommend putting it on a mat or anything that would prevent it from moving when your cat scratches. We hope this review of the best scratching posts for cats helped you select the purrfect furniture for your feline! The cat scratching stands above are durable and we do think they are the best of the best (according to reviews). Whether you are looking for something pretty, sturdy, vertical, horizontal or that simply does the job, we are sure you will find something you like here! 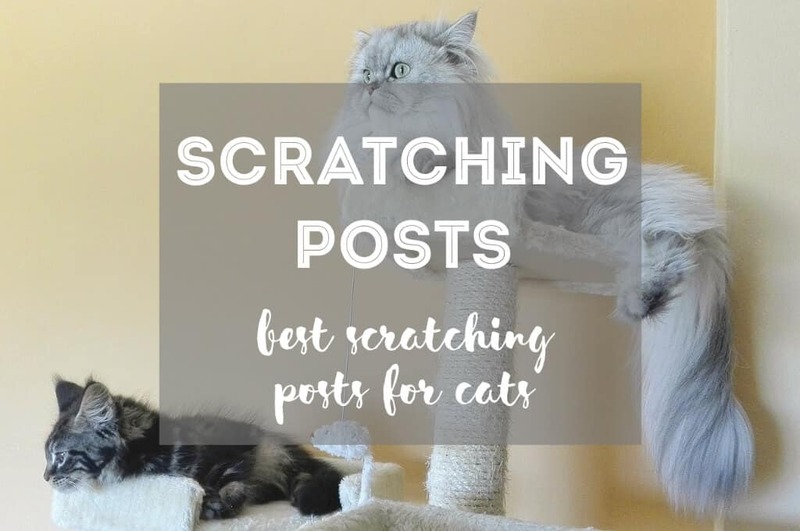 If you are looking for a cheaper version, make sure to check out our article on the best cheap cat scratching post or if you are into DIY projects, you could also choose to design your very own cat scratcher! Let us know which one you prefer by commenting on this post and follow us on Facebook, Twitter, and Instagram. Thank you! Previous Post Cat Tail Language: What Is Kitty Trying to “Tail” You? Next Post How to Travel with a Cat on a Plane: Yoda Flies to Nepal! Scratching posts are great when you have them set up but take forever to setup. When you screw up the setup it’s a hassle returning it back to Amazon. Sometimes just buying a ready made cardboard scratcher is the better option. Hey Scott! Yes, depending on the brand and what material scratcher you buy, sometimes it can take some extra effort to set up – alas, it may last much longer! When Yoda moves around with us a lot, we get him a cardboard scratcher as his temporary scratcher so he still reaps all the benefits 😉 Thanks for dropping by! Scratching posts are great, but if they take up too much space you might want to consider a cardboard cat scratcher. They’re recyclable and don’t take much space. How to Travel with a Cat on a Plane: Yoda Flies to Nepal!